In her thesis for a master of fine arts in painting, Gwen Peine Toomalatai (Toe-o-ma-lá-tie) expressed what her art means to her: "My paintings are mainly a reflection of my own journey in life and the lessons I've experienced up to this point. The animals, architecture, and nature that are represented in the paintings are intricately connected to my personal search for meaning and the discovery of the sacred both within and without." The luminous quality of Toomalatai's paintings is accomplished by a series of meticulous steps. She uses birch plywood, rather than canvas as her base because the rigidity of the boards suits her technique of adding and removing layers of paint. Initially, each board is covered with an oil base that is applied by knife. This provides the texture to Toomalatai's work. 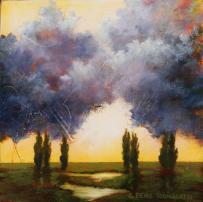 The shine derives from her use of layers of paint and a glaze medium that she developed herself. The purity to the hues in Toomalatai's images is the result of the artist not mixing colors together. She applies a layer of paint mixed with glaze to the wood, and then wipes back or sands down that layer, before applying the next layer of paint and glaze. Keeping the colors pure means that each layer remains rich and clear. Light travels through each layer, hits the white base, and then reflects and refracts back through the image to the viewer. The evolution of this technique was spurred by Toomalatai's study and appreciation of 17th century northern European painters, most notably Rembrandt and Jan van Eyck. Rembrandt's manipulation of light and shadow, and the glowing quality to van Eyck's paintings, prompted Toomalatai to explore pure pigments and different surfaces to paint on. After considerable experimentation, she arrived at the methods she employs in her art to this day. Even in framing her paintings, Toomalatai employs a subtle concept of working with light and shadow. She developed the technique to provide a simple yet elegant finishing touch to her art. Creating each frame is a family affair. After Toomalatai's father crafts the frame from alder wood, her husband seals it and then applies a chalk base and a filler of red clay to the wood. Next, Toomalatai covers the frame by hand with 22-karat gold leaf. Finally, the artist's husband burnishes the surface and paints the outside and lip of the frame with a black acrylic. All that remains following this long and painstaking process is to fit the painting into the frame for display. The result of this exacting commitment is a collection of paintings that exalt the sacred beauty of nature, imparting the joy and wonder present in the world, as glimpsed and subsequently captured in a moment by Gwen Peine Toomalatai.